-Belgium (12)- If you thought it was a surprise to see Switzerland among the seded team in FIFA’s World Cup draw, it should have been just a surprising to see Belgium. Even though Belgium was in the FIFA Top 8 at the time, Belgium is a country one would not normally expect to see as a seded team. Their best World Cup finish ever of the eleven previous World Cups they’ve played in was fourth in 1986. The last World Cup they played in was 2002 and they didn’t even qualify for Euro 2012. However that all changed in 2012 when they hired Marc Wilmots as head coach after being assistant coach for three years. Wilmots himself had played for Belgium in four World Cups and even scored five goals in World Cup play. Belgium was placed in possibly the most difficult European qualifying group for 2014 but they played like magic. They won eight games and tied the other two en route to coming first in their group and automatically qualifying with just one game to go. The spirit of the Red Devils was felt again in their homeland as the country greeted them upon their return in big fanfare. Their success helped put them in FIFA’s Top 8 around the time of the draw which led to them classed as one of the seded teams. Their performance in qualifying was so impressive, Wilmots was signed on to be coach for another four more years. However Belgium’s play in friendlies have not been so spectacular as they’ve lost to Romania, Colombia and Japan. They do have impressive wins against the U.S.A. and Sweden and even tied France. Nevertheless their lackluster friendly play has dropped them from the Top 8 and now stand 12th. Nevertheless this is a big boost for country as this will be their first World Cup in 12 years. Half the team play for top European teams like Manchester United, Bayern Munich and Atletico Madrid. Whatever the situation, no doubt they’ll send the message that Belgium is back. -Algeria (25)- Algeria is another team coming to this year’s World Cup hoping for a breakthrough moment. They’ve competed in three World Cups before: in 1982, 1986 and 2010. They have had better luck defining themselves at the Africa Cup of Nations where they’ve made it as far as the semifinals five times and even won back in 1990. However they’re hoping this World Cup to finally progress past the Group Stage. Their squadron is coached by Bosnian Vahid Halilhodzic who coached the Ivory Coast at the 2010 World Cup. Top players include Madjid Bougherra, Islam Slimani and Sofianne Feghouli who’s already being called ‘the New Zidane.’ Algeria won their opening group in qualifying for the World Cup. They would then face Burkina Faso for the berth. The first game ended with a 3-2 loss but Algeria came back 1-0 to clinch their trip to Brazil. They’ve also not lost a friendly in the past two years and would include wins against Slovenia and Romania and ties to South Africa and the Ivory Coast. If they play consistently, Algeria could have their best ever World Cup here. -Russian Federation (18)- Russia is a team that has struggled to prove itself since the breakup of the USSR back in 1991. Back during the days when the USSR did well by advancing past the Group Stage in all but one of their seven World Cup appearances and even finishing fourth in 1966, the majority of Soviet players were Russian. Since the collapse of the USSR in 1991, Russia has continued to shell out remarkable talents in the years since. However the national team has always fallen short of making a statement of their prowess. They’ve only qualified for two World Cups–1994 and 2002– and only went as far as the Group Stage in both cases, even though Ukrainian-born Oleg Salenko set a World Cup record in 1994 with the most goals in a single World Cup game: five. They did however have a moment of glory by finishing third at Euro 2008. However they come to Brazil looking for more as they will have the task of hosting the next World Cup in 2018. No doubt they want to create an impression here. Although all the players play for Russian League teams with many playing for Dynamo Moscow, their coaching staff is almost all Italians and the head coach is Fabio Capello who has coached AC Milan, Real Madrid, Juventus and England up to 2012. Russia performed well enough in qualifying to win their qualifying group over heavily-favored Portugal. They’ve showed their abilities by scoring wins against Portugal, Slovakia, South Korea and Morocco. They’ve also tied countries like the U.S.A. 2-2, Serbia 1-1 and Brazil 1-1. It’s make or break for the Russian team here in Brazil. They come to play well and learn. -South Korea (55)- Isn’t it interesting that Group H has two teams named The Red Devils? There’s Belgium, where the Belgians call them les Diables Rouges or de Rode Duivels, and there South Korea who also go by the name the Taegeuk Warriors. South Korea has traditionally been the best team in Asia. None of the other Asian countries here in Brazil have as much of a track record as South Korea who will be playing in their eighth straight World Cup. Their best finish ever was a fourth-place finish in 2002 when they co-hosted with Japan. Much of their prowess has to be with the K-League that was started in 1983 and has really taken off since. However South Korea appears they don’t have the prowess they’re used to showing. They’ve had wins against Greece and Switzerland in the past two years. However they’ve had to endure losses to Brazil, Croatia, the U.S.A., Russia and Mexico. Since qualifying for the World Cup, they’ve changed coaches to Hong Myung-Bo who’s had experience coaching in the MLS. They’re hoping he can make an improvement for the team and he’s already helped Korea move up to 55th from 59th a month ago. It’s quite possible they might prove in Brazil those low FIFA rankings are just bad estimates. And now my prediction for the two advancers: I predict Belgium and Russia with Algeria the one most likely to upset. Okay, I’m done reviewing the last World Cup group. Now time to focus on the last two World Cup stadiums. My final Stadium Spotlight focuses on the two stadiums in two of Brazil’s biggest cities. One is a new stadium, the other is old and legendary. On will be hosting the opening ceremonies and opening match. The other will be the stage for deciding the winner of the Cup, just like it did 64 years ago. 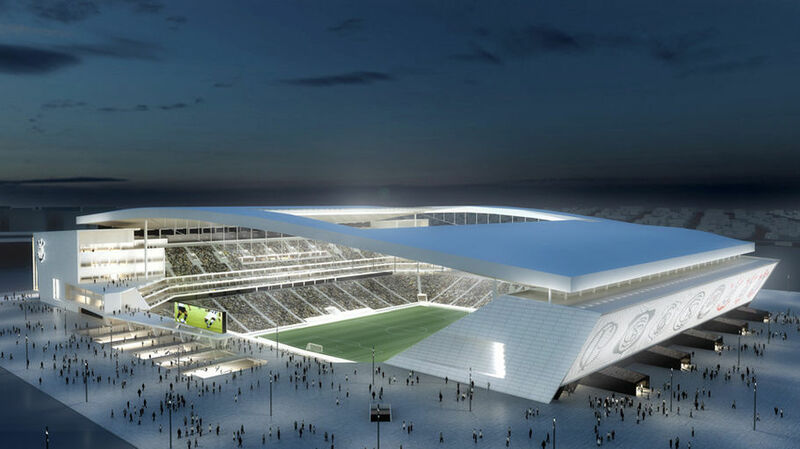 Sao Paulo’s new stadium came about as Estadio Pacaembu was too small to host World Cup games and was getting too old. Also the much bigger Estadio de Morumbi was judged by FIFA as unsuitable to hold World Cup games. Thus the creation of the Arena de Sao Paulo. However creating the stadium came with difficulties. First, national funding for the stadium was delayed for two years. Secondly, the Arena originally planned to hold 72,000 for World Cup games. Relocation of TV Equipment and VIP seating reduced the capacity to 61,606. Even though the stadium has officially been opened on May 10th, it was noted modifications were still underway two weeks ago and people are still unsure if the stadium has been finished. They better be ready June 12th because they’re hosting the opening ceremonies and first match: Brazil vs. Croatia. After the World Cup, the seating will be reduced to 48,234 and will be managed by the Corinthians football team who will have the stadium renamed Arena Corinthians. The stadium is also a venue for the 2016 Summer Olympics. If many people view football as a religion, then the Maracana has to be one of its prize temples, especially for Brazilians. This stadium was opened in 1950 to host the World Cup. The final game of that World Cup set a world record that stands today of the largest attendance of a soccer game: official count at 199,854 but actual attendance is estimated around 210,000. Since the World Cup, the Maracana has continued to attract large crowds to games for clubs like Vasco da Gama, Botafogo, Flamengo and Fluminese. 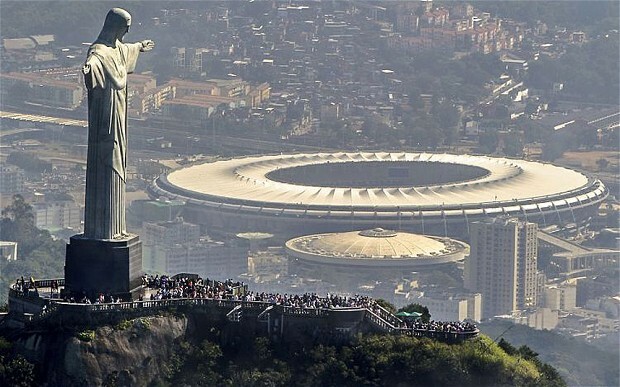 The latter two still have the Maracana as their home stadium. However the capacity was greatly reduced in 1992 when an upper stand collapsed, killing three and injuring 50. Remember there was a time when stadiums allowed for both seats and standing area which allowed for such big totals I talked about. The Maracana was converted into an all-seater stadium since the accident. 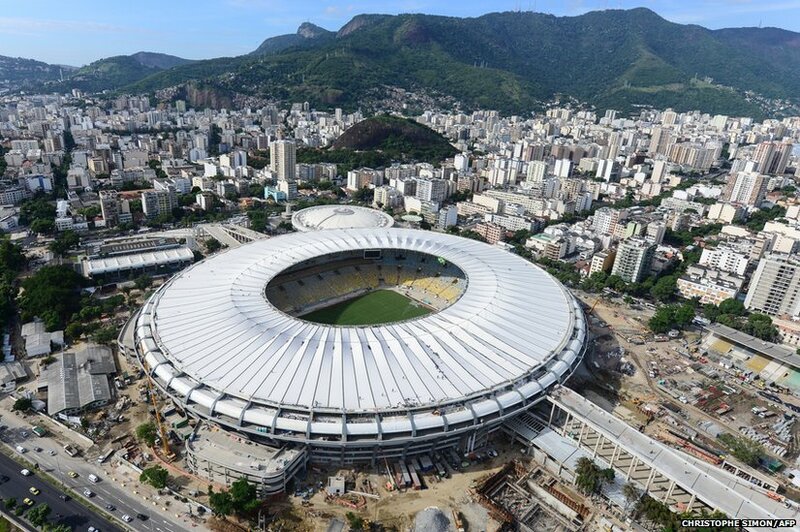 A bit of trivia: The Maracana can never be demolished as it was classified as a national landmark in 1998. For the 2014 World Cup, major preparations and changes had to take place. The irony being the stadium had already underwent major renovations starting in 2000 just after it celebrated its 50th anniversary and completed in 2007. The original seating bowl that had a two-tier configuration was demolished and made way for the construction of a one-tier seating bowl. New seats in colors of yellow, blue and white form among the green match of the field to create the national colors of Brazil. The renovated Maracana played host to the Confederations Cup last year. After the World Cup, the stadium will return to being the host venue for Flamengo and Fluminese, continue to host major concert and will be the stage during the 2016 Summer Olympics for football games and the opening and closing ceremonies. And that wraps it up. I’m done predicting World Cup groups and I’m done reviewing World Cup stadiums. All that needs to be done is let the show begin. I’m sure it will be a memorable one.